Silence sends a message, there’s no such thing as playing neutral. When we stay silent, others will always fill the void. 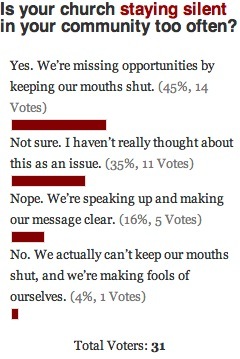 In a not-too-surprising turn, 45% of you said that your churches are missing opportunities by keeping your mouth shut. People are making incorrect assumptions about your church, and other viewpoints are taking hold as you’re not expressing yours. That number probably isn’t everyone that’s struggling, though. 35% of you haven’t given much thought to this idea, so you’re not sure. I’d urge you to read and re-read Paul’s pieces, taking a little more time to consider the consequences of sitting back and not speaking your beliefs. Next up, 16% of you feel you’re doing a great job with this. Folks know where you stand, and you’re trying to speak life and truth into your community. They don’t assume your disengagement from your silence, and they know your stance on issues that matter to you. Kudos. Lastly, 4% of you find yourselves at the other end of the spectrum. You’re speaking up, all right. You can’t keep your mouth shut, and you have to keep putting your foot in it. That’s one of the delicate points, here. As churches, we have to speak up, but we have to remember to always do that with love and kindness. It’s a tough balancing act. This week, we’re talking about photography, and a long-time debate we’ve seen: stock photography. So let us know, which do you think works better in marketing materials, real photography or stock photography?